Indivisible Austin has filed a Freedom of Information Act request with the U.S. Department of Treasury to demand answers for how Trump’s tax cut will benefit Austin’s wealthiest corporations. As one of the biggest tax cuts in American history, Trump’s $1.5 trillion tax cut is especially benefiting corporations, commercial real estate interests, and private equity managers, among others. The tax cut comes as Austin City Council deliberates whether to require private employers to provide mandatory paid sick time to Austin families. 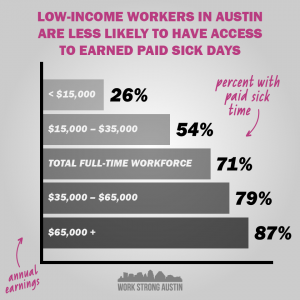 According to the Work Strong Austin coalition, an estimated 37% of Austin residents do not receive paid sick time from their employer. The vote is currently scheduled for February 15, 2018. As Austin continues to grow, too many working people are left without the ability to improve the quality of life for themselves and their families. All workers, regardless of background, wage level, and occupation, should have access to earned sick days. Unfortunately, approximately 223,000 Austin workers – 37 percent of the total workforce – are at risk of losing wages or being fired if they follow doctor’s orders when they or a family member are ill. In September, Austin City Council passed a resolution that would begin a public input process to bring Austin working families, business leaders, community groups and public health professionals together to discuss paid sick days. Please join us for the Second Stakeholder Meeting: November 16, 4:00pm – 6:30pm, Town Lake Center Assembly Room 130, 721 Barton Springs Road, Austin, Texas 78704. Come and support paid sick days. We need to make sure our voices are heard. You can also provide feedback to the City of Austin about why it’s critical for all Austinites to have paid sick days on this online forum here. Can you please take a few minutes to fill out this survey. La ciudad de Austin sigue creciendo, debido a esto demasiadas familias trabajadoras se estan quedando atras en la posibilidad de proveer y mejorar la calidad de vida de si mismos y de sus familias. Todos los trabajadores, independientemente del tipo de trabajo que hagan o de cuánto ganan, deberían de poder cuidarse a sí mismos o a un ser querido en situaciones de necesidad.Desafortunadamente, aproximadamente 223,000 trabajadores en Austin — lo que equivale al 37 por ciento de la fuerza laboral — están en riesgo de perder salarios o ser despedidos si siguen las órdenes del médico cuando ellos o un miembro de su familia están enfermos. En Septiembre el Concilio de Austin pasó una resolución para iniciar un proceso público en el cual familias de Austin, negocios, grupos comunitarios, médicos entre otros discutirán la posibilidad de una ordenanza de días de enfermedad pagados. Por favor acompáñenos a la segunda reunión de este proceso el 16 de Noviembre de 4:00pm – 6:30pm, Town Lake Center Assembly Room 130, 721 Barton Springs Road, Austin, Texas 78704. Venga a apoyar esta campaña, tenemos que asegurarnos que nuestras voces sean escuchadas. También puede dar su opinión a la Ciudad de Austin de la importancia crítica para todos que todos los trabajadores tengan este derecho de días de enfermedad pagados. Puede llenar este cuestionario aquí. Former Donald campaign chair Paul Manafort was indicted by a grand jury Monday in the first legal actions of Mueller’s investigation. Here’s a fantastic breakdown of the indictment, which includes conspiracy against the United States, money laundering, and making false statements, and here’s a great FAQ primer. Donald’s foreign policy adviser George Papadopoulos pleaded guilty to making a false statement to federal investigators, which has now shed light on other administration members’ potential involvement (and may get Jeff Sessions accused of perjury). In light of conservative voices like FOX trying furiously to get Mueller to step down, MoveOn.org is organizing “Nobody is Above the Law Marches” to mobilize immediately in case Donny fires Muller as the heat gets turned up. In good news, a majority of Americans approve of Mueller and the Russia probe and think it should continue (and nearly half are pretty sure Don John has committed a crime, for what that conjecture is worth). But call your MoCs and ask that they support one of the three bipartisan bills designed to protect Mueller and his investigation: S.1735 & S.1741 in the Senate, and HR 3771 in the house. Sam Clovis—the climate change skeptic Donald nominated as chief scientist of the Agriculture Department who has no academic credentials in either science or agriculture—has withdrawn himself from consideration after his name surfaced in the Russia investigations as one of the top officials on Donny’s campaign who was aware of George Papadopoulos’s efforts to meet with Russia for dirt on the Clinton campaign. The National Association of Home Builders has declared war on the Republican tax plan, which makes no mention of property tax deductions so essential to promote home ownership. The National Association of Realtors has joined their opposition. In response to other outcry against the ill-formed tax plan, the GOP has backed off their plans to lower taxes for the wealthiest Americans, and is making noises about making the proposed corporate tax-rate slash temporary instead of permanent, as originally proposed. Elsewhere in Donald’s thwarted attempts to subvert the Constitution, a federal judge blocked enforcement of Donny’s spurious decision to bar transgender servicepeople from military service. In the face of widespread consternation about Whitefish—the two-person utility company that was a strong Trump campaign donor before being awarded the $300 million Puerto Rico infrastructure contract in a no-bid campaign—Puerto Rico has canceled the company’s contract. One of Donny’s far-right-extremist appeals court picks was knocked down by the American Bar Association committee as “not qualified,” citing his temperament and his ability to rule impartially on issues like abortion rights. The 600-plus-page Climate Science Special Report, part of an even larger scientific review known as the fourth National Climate Assessment, or NCA4, has concluded that it’s “extremely likely” that man is the “dominant cause” to potentially catastrophic climate change and global warming. This report, the nation’s most authoritative assessment of climate science, directly contradicts this administration’s frequent denials that humans are the cause of climate change—or in fact that it exists, a fact that might be especially embarrassing to the White House considering the study’s authors include experts from leading scientific government agencies, including the National Oceanic and Atmospheric Administration, NASA and the Department of Energy, as well as academic scientists. Finally, in shocking news to no one, Donny’s approval ratings are tanking. Last Monday one poll showed they’d sunk to a new low of 33 percent—another poll Sunday had them at 37 percent, lower than any other president at this point in the presidency in seven decades of polling history. Donald loves superlatives, so let’s humor him by pointing out that these are the lowest approval ratings for a first-term president in modern history—disgraceful!—and one of the worst approval ratings of all time. As this article points out, there have been only two days in Don John’s entire reign where more people approved of him than disapproved—both within his first week in office. Sad!